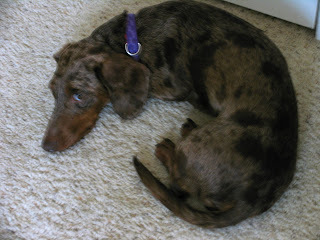 A little “tale” about a long dog…..
Today, “Potts”, as the grandchildren nicknamed him, arrived at our house. His other “grandmother” brought him from Sacramento, so that we could transport him to his family at the ranch. He was supposed to have a nice vacation this year, away from cows and tractors and pick up trucks flying into the driveway, not looking for little dogs. Within a week, the plan changed and here he is pining, wandering around with a “hang dog” look and stretching out in front of every doorway hoping that when the door opens, it will be his “momma”, my darling daughter-in-law, Dolly. Usually, Spots is an eager beaver, adventuresome, and fearless, if he is with the right people. He rides happily and calmly while the raft swirls about the pool at racing speed. An extra long mottled Dachshund, Spots is a true “foodie”. He eats about anything, especially if it’s not regular, plain, dog food !! The goats didn’t mind having a guest for lunch and Spots helped himself. Fortunately he loves riding in cars, and will be very happy to load up tomorrow morning for the trip up the mountain to the ranch. He will be ecstatic when he sees the kids and his “momma”, and we will have safely delivered our cargo ! Choosing qualities and stories that successfully describe my Dad is next to impossible. (I was overwhelmed with this same sense of inadequacy when I wrote about my mother on Mother’s Day). His more than 80 years of living history requires a book. Since I haven’t started a book yet, I’m only mentioning a few fun facts about my Dad in this blog. Enterprising, adventurous, self confident, and courageous characterize my Dad’s life. He grew up on a farm in the wild, windy panhandle of Texas. At two years old, my Grandmother told us, he climbed to the top of a 40 foot windmill to get a better view of the water below. As Grandma moved up the skinny little ladder to “fetch” him, she continued to calmly discuss the “pretty water”, telling him she was coming up to see it too. I am amazed that she didn’t freeze, or scream or wet her pants. She told me, all she could think about was getting him safely down. She didn’t want him to be frightened and start moving around on that platform in the sky ! There was no one to help her. My Grandpa and the farm hands were several miles away, plowing fields. I’m sure she was praying the whole time she was climbing ! Once she retrieved my father, she went inside, locked all the doors and laid down to recuperate from her distressing ordeal . My Dad didn’t even take a nap that day. At nine years old, he was driving a tractor and plowing fields. My Dad and his siblings worked hard, but found plenty of time for fun and mischief. 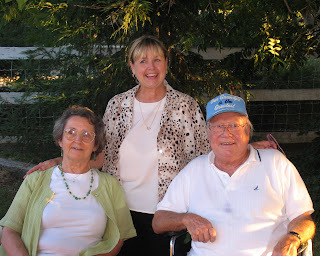 His older brother Joe, and his lovely younger sister Mavis, have always laughed and told stories about one another. Sometimes, growing up, they refused to tattle on one another. My Grandmother’s solution was to spank all three of them. They never let that or any other issues divide them, and have always remained close. I could tell you about all the businesses he’s started. Over 40. Our backyard in Los Angeles hosted several enterprises; fiberglass boats, flocked Christmas trees, and auto restorations. One of the most successful businesses, was Rio Linda Chemical Company (RLCC), in Sacramento. This company patented a process that is still recognized in the water treatment industry as extremely innovative. RLCC became a family business, involving my husband and brothers, which they managed for over 15 years until the business was sold to a Fortune 500 Company. I could tell you about the ingenious machines he has built; several gold dredges, a chemical powder packaging machine fabricated entirely from scrap metal. He completely restored the body & rebuilt the engine of a 1994/1995 (depending on which end of the car you look at) Cadillac. He continues to drive this vehicle. I could tell you about our camping adventures. He converted a 1934 Ford Long Bed (14 ft) truck into a moving van/sleeper, driving it over the graveled AL-CAN (Alaska-Canadian) Highway all the way to Alaska. We camped out every night sleeping under mosquito nets. And one summer we camped out for 3 months searching for uranium near Bishop, California. I could tell you about how he likes to travel and see the world; five years ago, he and my mother joined Phil and I on a 21 day trip to China. I could tell you about the sacrifices he made so my mother could finish college and get her teaching credential. He worked the swing shift ( from 3:00 in the afternoon, until 1:30 AM), so he could be home with us, while she took classes in the mornings. He drove back and forth from Placerville to the Bay area at least twice a week to work on the Bay Area Rapid Transit (BART) for several years. There was no construction work in El Dorado county. He and my mother preferred that my brothers and I be able to finish high school in one place. I could tell you that he is devoted to his children, grandchildren, and great grandchildren. He loves to attend birthday parties, school events and as many sports events as possible. Part of his legacy to his family is his faith; serving in the Baptist church as a deacon, and participating in the Gideon organization. But I want to tell you about one of my treasured memories, that of course, centers around me. I loved Annie Oakley as a child and I desperately wanted a horse . We lived in the Los Angeles area, in a neighborhood with over sized backyard lots, not on any kind of acreage. Riding stables were quite a distance from our home and costly. For some reason, my parents decided to buy me a burro. Burros are gentle and relatively safe for novice riders, easy keepers, very personable, and much less expensive than a horse. We didn’t own a pick up, or a horse trailer, so my precious father, walked four miles, leading Pedro, the burro, home. A man of great dignity lead a burro along a busy highway, because his daughter “needed” something to ride. Pedro was an instant neighborhood hit. I mean, really, who in L.A. has a resident donkey in their backyard ? I loved Pedro. He did get into some trouble with my mother when he kept pulling the freshly laundered clothes off the line. He really riled her though, when he ate my lovely new fluffy red petticoat. She took after him with a broom, walloping him, and yelling something about being a “son of a gun”. I rode him for hours round and round our backyard lot, content to dream of ” cowgirl” adventures. My father had provided what I “needed” to the very best of his ability. I feel extremely blessed to have such a wonderful Dad! Happy Father’s Day, Daddy ! May all your infusions be blessed ! My “Honky Tonk Man” sang, ” Momma, Don’t Let Your Babies Grow Up To Be Cowboys” at the Maritime Restaurant & Bar on California Street in Redding. www.maritimeredding.com . Roger & Casey, friends from the Oregon Street Antique Mall (anewscafe.com/placeolder/oregon-street-antique-mall-2/), were guest bartenders at Maritime Friday night. We stopped by for a drink, and to say hi. Uni, owner of Maritime, ask Phil if he would sing. How did she know he could sing ? Maybe she randomly ask people if they would like to sing? I don’t know. She is very sweet and wants everyone to have a good time at her establishment. I said, “He knows lots of country western tunes”. Phil and Jimmy Bryant, the talented, and very accommodating musician who was playing that evening, decided on a Waylon Jennings tune. 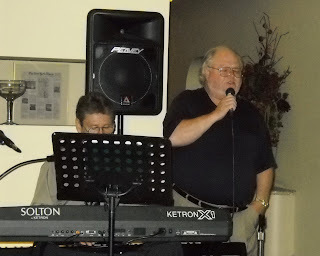 Phil is a gifted singer, but his audience is usually a church congregation, and he usually brings his guitar. Phil has been singing since I’ve known him. And that’s a long time now. He’s always played a guitar or banjo and he’s always written songs. Whether he is working, driving, or plowing a field, he’s usually mulling over a “tune”. He had lots of practice. He sang to our children every night at bedtime. Now, in their mid-twenties and early thirties, they have fond memories of his version of various Bob Dylan, Waylon Jennings, Willie Nelson, Johnny Cash, or Tim Harden tunes. Jimmy asked Phil to send him some cowboy music so he’d be ready the next time we stopped by. I told you, he was accommodating ! Well, we just might hunt up some of those old “honky tonk” tunes…it was sure fun ! Sometimes, if I ask for hot tea at a restaurant, a mug of lukewarm water and a colorful assortment of little square packages are set in front of me. I inhale and politely thumb through the Herbal Peppermint, Berry Berry (no caffeine), and Chamomile packets, and finally inquire, “Do you have any Black tea?” Off the server trots, returning with an off brand lifeless tea bag. The temptation to expound on real tea, is overwhelming. Keeping my hand on my mouth & shoving the tea information file to the back of my mind, allows me to remain a decent, sweet, smiling human being. Anything that can be infused is referred to as “tea”. Herbal concoctions, often consumed for medicinal purposes, abound. Common herbal “teas” include Chamomile, Hibiscus, Lemon Grass and various Mints ( Spearmint, Peppermint). Fruit infusions like Raspberry, Cranberry, or Apple are popular “teas”. However, unless one of these infusions contains some form of the Camelllia sinensis plant, it’s not really tea! Camellia sinensis , an evergreen bush, is a single species, of many varieties. The tea plant can grow easily in most conditions, but does not always produce “good” tea. 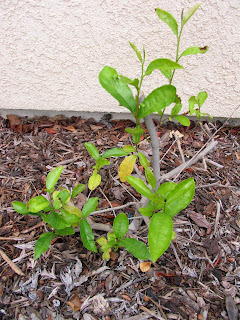 ( My own little tea plant is “failing to succeed” in this Redding, California heat..see photo). Tea, like wine, is influenced by the soil, rainfall, elevation and a myriad of other factors which contribute to its characteristics. Countries that have perfected specialty teas include India, China, Japan, Taiwan, Sri Lanka, Kenya, Malawi, Tanzania, and some South American countries. In the United States, there is one tea garden that produces and sells tea. The Charleston Tea Garden, on Wadmalaw Island, South Carolina, owned by Bigelow, still harvests and manufactures tea. All real tea, whether it is white, green, black or oolong, is produced from this Camellia sinensis plant. I think when I’m eating out, my drink order will be, “Cameillia sinenis, please”. Then, I’m sure there will be no confusion. 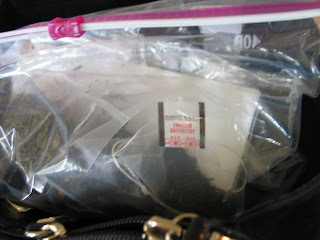 Just in case though, I do have my own real tea, in a zip-lock baggie in my purse ! Some people carry a flask with their favorite alcohol, I carry a plastic baggie with my favorite tea! May all your infusions be tea-lightful !